I got this from Perky who got it from here. Define “dancing.” When I was a newlywed, hubby and I did several things “under the stars” but I don’t know if dancing was one of them. Have you ever listened in on a private conversation? I’m a writer. Sitting in a restaurant or any busy place, I tend to focus in on what other people are talking about just to see if I can get good dialogue or story ideas or something. Have you ever splurged on something you normally wouldn’t purchase? What was it? I have gone out and gotten a haircut when that’s completely not something I do regularly. 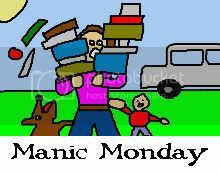 Thanks for joining in on Manic Monday this week.